"Cupcakes are also known as fairy cakes, due to their tiny size and their whimsical appearance. 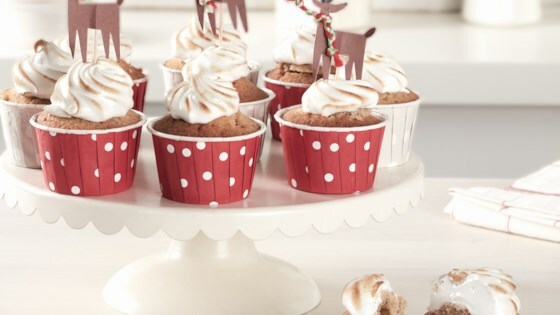 Can you resist when you find a cupcake in front of you filled with Nutella® hazelnut spread and topped with meringue? We bet you'll feel like you have no other choice than to taste it." Beat butter and sugar for about 5 minutes, or until light and fluffy; beat in 2 eggs and milk. Stir in hazelnuts. In separate large bowl, sift together flour, baking powder and salt; fold in butter mixture until combined. Spoon mixture into 12-cup paper-lined muffin pan (or individual cups, if preferred). Bake for 20 to 25 minutes or until tester inserted into center comes out clean. Transfer to rack; let cool completely. Using small knife, cut out 1-inch deep hole in top of each cupcake. Spoon Nutella(R) hazelnut spread into piping bag fitted with small, plain tip. Pipe about 2 tsp Nutella(R) hazelnut spread into each cupcake. Meringue: In small saucepan, heat sugar and 2 tbsp water until temperature registers 245 degrees F on candy thermometer. Meanwhile, using electric mixer, beat egg whites until soft peaks form. Slowly pour the sugar syrup down side of bowl, beating until side of bowl is barely warm and stiff peaks form. Transfer into piping bag; pipe over cupcakes. If you like: Using small cooking blowtorch, caramelize the meringue (or broil on high).